We run your motorcycle on a DynoJet 250i Dynamometer machine which measures torque and horsepower throughout the RPM range. Dyno Tuning will allow us to maximize all aspects of your motorcycle's tuning to achieve optimal power and efficiency. 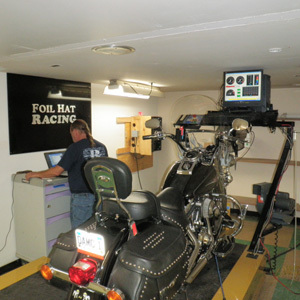 Foil Hat Racing located on site, has a state of the art 250i Dyno Jet dynamometer and trained professionals who run the dyno and properly tune your motorcycle. Whether for Race, Street or Off Road Foil Hat Racing provides Dyno Tuning services exclusively for Bikes Built Better and is located in the same building. We will tune any two wheeled motorcycle of any configuration whether carbureted or fuel injected. Bikes Built Better is an authorized dealer for Power Commander, Vance & Hines, Cobra and many more aftermarket performance fuel management and exhaust manufacturers. Our dyno alows us to write fuel injection maps in real time as your bike is being run and put under load. You spend a little more up front but the result is a bike that runs at its peak for the options you have installed and your air fuel ratio will be as close to optimal as it can be for the components you have chosen. Today's Dynojet dynamometer does so much more than tell horsepower and torque. It can look into your motorcycle and see things like fuel mixture, cam timing, clutch slippage, how loose or tight your drive chain is and whether or not it needs to be replaced, how your sprockets are holding up, whether your cush drive is worn, if your fuel needle needs to be adjusted, if your bike needs a tune-up, a valve adjustment, even if your speedo or your tach are calibrated properly. All this is only the beginning. A Dyno Run can show you different scenarios of what your bike would be like with different bolt-on accessories like exhaust fuel management systems or jet kit, different cams, a sprocket change, or cam timing setting, etc. The Dyno will show you exactly what you are going to get for your money. You can be confidant that, with a Dyno Run before and after modifications, you not only get what you want but that the job was done right. The dynamometer has also made a huge impact on the racing industry. Most racing teams use a dynamometer to tune their bikes. These days, you are at a disadvantage if you frequent a shop that does not have a Dyno. It has become the industry standard and a motorcycle shop without one simply cannot provide the state-of-the-art technology and service that a cycle shop with one can. Fifteen minutes on a Dyno can give you more information on your bike than five motorcycle shops without one. Let us prove it. Simply put, a dyno tune is making adjustments to your bikes ignition, fuel and air supply, to achieve the most possible horse power and torque, while maintaining optimal air fuel ratio. To do this we use our state of the art Dyno Jet dynamometer. What is horsepower and torque and air-fuel ratio? Horsepower is top speed and torque is what gets us there. Air fuel ratio is how much air and fuel are mixing and entering the combustion chamber. This is how rich or lean the motor is running. Either end of the scale will cost you power, torque, economy, and efficiency. If you get the balance too far out on the lean side, damage can be done to the motor. If you get unbalanced to the rich side, you can foul spark plugs, dilute your oil with gasoline, and generally cause a noticeable reduction in performance.